Creating comics must be difficult. Otherwise, everyone would do it. Since reading the web comic project description, I felt like I was at a bit of a disadvantage — I’m no artist. But, I was put in charge of creating the main character, Alex, in my group’s web comic, Quest In Progress. Our comic is stylized as a throwback to Mario video games, so I needed to learn how to draw pixel characters. Not too enormous of a task, I thought. 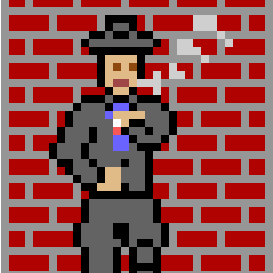 But, I’ve only created extremely simple pixel characters before, just for fun. I had a basic idea of how to accomplish the task: create a small, 32×32 to 64×64 image, and fill in the pixels individually. I started out trying to use black to give a nice outline to body parts, but quickly realized that separated the character from the setting too distinctly–I wanted Alex to blend in to the surroundings. So, I decided to remove all of the distinct black outlines, and used the black and white airbrush tool to create distored, blended outlines. So, by simply creating a simple color-defined regions, I was able to suggest more depth to the image without actually creating any, or putting in much additional effort. After reading Ault’s essays regarding Donald Duck, I decided to embrace the cartoon aspects of pixel drawings. Rather than attempting to create a realistic representation of a character, like Alex jumping with a sword and shield, I started trying to convey the action primarily, with perspective becoming secondary. With the subsequent comic update, I drew a more friendly Alex. Which is noticably more warm than the original Alex. He actually has some character, a more distinct style, rather than seeming like a character’s placeholder. So, rather than being overwhelmed by the project, I delved into it, and learned quite a bit in terms of my own personal style. I wanted to leave some information that might help some people create similar simple pixel art. Frankly, I don’t have a solid grasp on the human figure, other than what looks unnatural, but felt like that grasp was hindering my first iterations. So, I let it go and let Barks’s “Vacation Time” and Ault’s analyses shift the perspective of my character. The pixelated artwork was well executed. I relate to this post because like you, I felt that I was at a disadvantage from my lack of experience/artistic capabilities. I enjoyed hearing your take on the development of your illustrations. It’s interesting to see the improvement in everyone’s work as their stories progress. I enjoyed reading your group’s comic for the humor and the specific art style. The way that you positioned Alex and crafted a pixelated world around a end goal really worked for the time constraints – six comics in three weeks is a lot to ask for. I love my group’s comic but it was much more broad and time-consuming than was optimal considering the deadlines; what I mean to say is that I respect your group’s process.